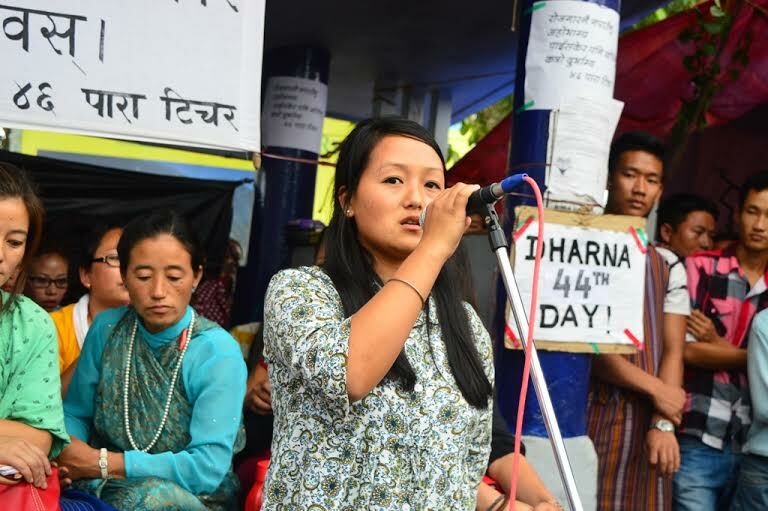 Jongmith Lepcha, one of the 46 para teachers today addressing people assembled in Triangular Park recapitulated their 44 long days of dharna in the town with a flashback starting from 26th February-when a job- notification for the lepcha para teachers were issued. 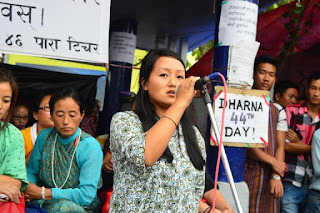 This afternoon the triangular park was mostly filled with the Rong Ong Pronzum or the associates of Lepcha Youth Association from Kalimpong, Kurseung and Darjeeling with the purpose of supporting the Para-Teachers in protest here. The teachers in dharna said that a new month will be followed after a day and they would have concluded two-three chapters by now, had they been teaching in their allocated schools, regretting the scenario one Peter Lepcha rued that it would have been incredibly productive if they could introduce something new to the students of their assigned schools in the past month which they wasted in protest. George Lepcha, a youth of Samthar rightfully appealed the local party in power vis-a- vis GJM to appease their obstinacy and clear the scene of unemployment here, addressing the Rong Ong Pronzum and the para-teachers he said, ‘I expect you to have sympathy towards our Lepcha brothers and sisters and I request you not to politicize this movement.’ Though he didn’t mention who ‘you’ meant in his approach but it was clear for the mass to understand that he meant the GTA chief, Bimal Gurung. Meanwhile, Jongmith Lepcha who was assigned in Pochak primary school in Gitabling said that they were notified with jobs on 26th February.